This open pot fryer's advanced metal fiber burner technology and precision controls give you excellent temperature regulation. The Delitas fryer features an easy-to-clean open pot design with a deep cold zone to trap sediment away from the cooking area, which increases food quality and prolongs oil life. Combine advanced combustion technology with decades of experience and customer’s feedback to set the standard for high efficiency operating. -	Convenient electronic ignition, melt cycle mode and boil-out temperature control. 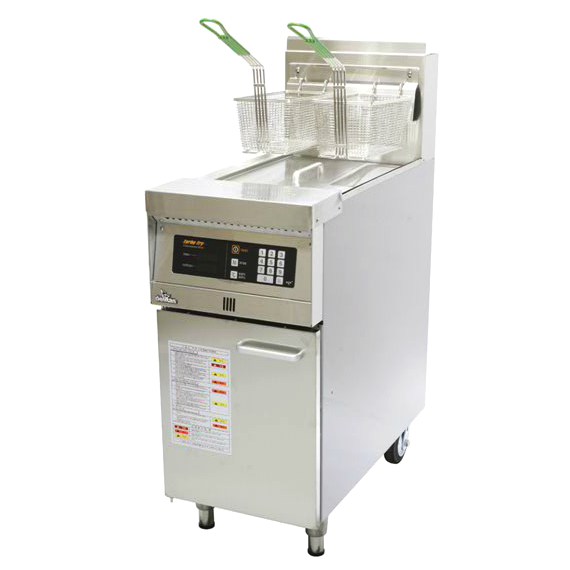 For Energy Saving High Production frying, Specify the Delitas high efficiency gas fryers with 3 Path Heat Exchange Supreme Burner Technology. Low Exhaust Heat and quick temperature recovery. LED's display a cooking time countdown, and provide precision frypot temperature checks, in addition to programmable "shake" and "hold" times, and much more. -	Safety device for sensing a flame & turbo fan. -	Audible alarm system for door opening & safety device for oil drain.